Celsius Shipping of Denmark has bought four tankers from Kirk Kapital, which means that the latter company no longer has any connection with shipping. Kirk Kapital sold two other tankers to the Danish shipowner Norden in April having sustained losses in its shipping business amounting to 224m Danish Kroner in 2017. The four tankers to be taken over are the 30,241gt/2009 built Gunhild Kirk, 31,510gt/2010 built Christina Kirk plus the 23,244gt/2004 built Marie Kirk and Edith Kirk, boosting the Celsius fleet to 38. Celsius was founded by Jeppe Jensen in 2013. Concordia Maritime revealed on 25th May that it had decided to participate in three Suez-max tankers chartered in by Stena Bulk. The 158,000dwt vessels were built in Korea during 2012-2014. The contracts are for 12 months, with an option to extend until the end of 2019. After delivery in May and July, the vessels will be employed on the spot market through the successful Stena Sonangol Suezmax Pool. Concordia Maritime’s share in the vessel charters is 50%. The contracts also include a profit-sharing clause with the contractual partner. Concordia Maritime’s presence in the Suez-max segment has been represented by the 81,187gt/2012 built Stena Supreme since she was delivered. This ship is also employed on the spot market via the Stena Sonangol Suezmax Pool. The pool, controlled by Stena Bulk and the Angolan state oil company Sonangol, comprises a total of around 25 efficient Suez-max tankers. 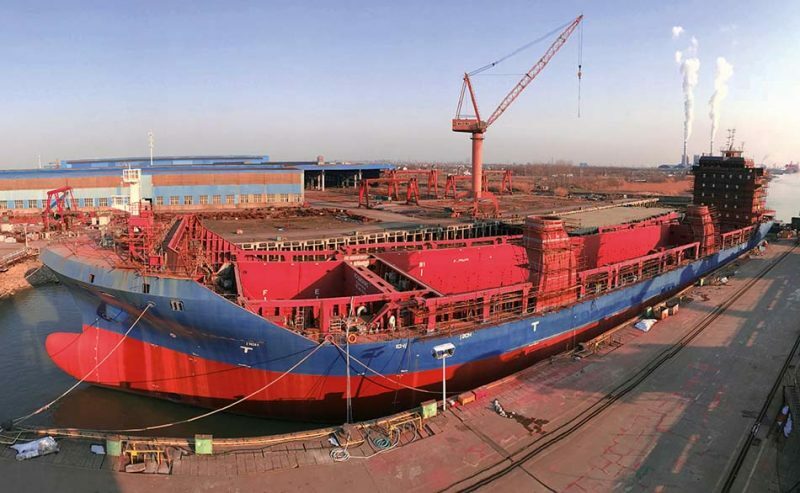 dship Carriers announced on 28th May that it had purchased the first of two F-500 newbuilds from Taizhou Sanfu Shipbuilding (above). This order is part of the fleet expansion programme initiated earlier this year. Not only do the F-500 vessels cater to changing industry needs, they also support a smaller environmental footprint. The delivery of the first vessel is expected by November 2018, and the second vessel is due to join the fleet in the first quarter of 2019. The F-500 vessel type belongs to the new generation of economic multi-purpose vessels, which have been specially developed to reduce fuel consumption and to increase stowage flexibility. The company is also looking at further purchase opportunities on the new build and second hand tonnage markets in order to continue its fleet expansion. The technical specifications of the new vessels make them a highly sought-after addition to the existing dship Carriers fleet. With a combined lifting capacity of 500 metric tons, they will be able to handle heavy and lengthy project cargo units. The second hold, with a length of over 75m, allows for the loading of extremely long cargo under deck, so clients can enjoy enhanced services that provide more stowage options.